Leaving the Dragon Lair, I danced with joy, boy oh boy! Seeing my inanimate furball Garfield as a soft toy! Giving me silent Garfield hugs with joy. Garfield does not eat soy! Neither does Garfield like conpoy. As I set out for my walk, I saw some unique plants and trees. In tiny spaces some of them grew or merely in pots. I am amazed at this yellow speckled top dribbled onto this tree top. It is the Angsana tree and its blossoms last one day only. It is actually tiny yellow flowers and it fell like confetti onto the road! I could see it fallen on the ground giving it a yellow stretch on the sidewalk and road. 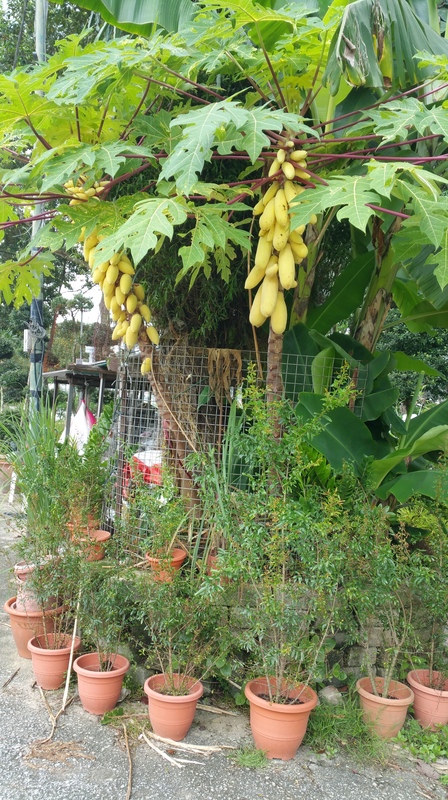 Yellow papayas? Pale yellow are rare..in fact I have never seen these till now. I saw this really unique orange gourd plant in a pot sans leaves. Ornamental gourds I think they are and I am unsure if it is at all edible. Below is a shrub that grew as a plant along the roads, planted by our government agency, NParks as part of their greening of lil red dot. I saw this rather “old” spinach plant growing rather resistantly along the walking path, out of a crevice! 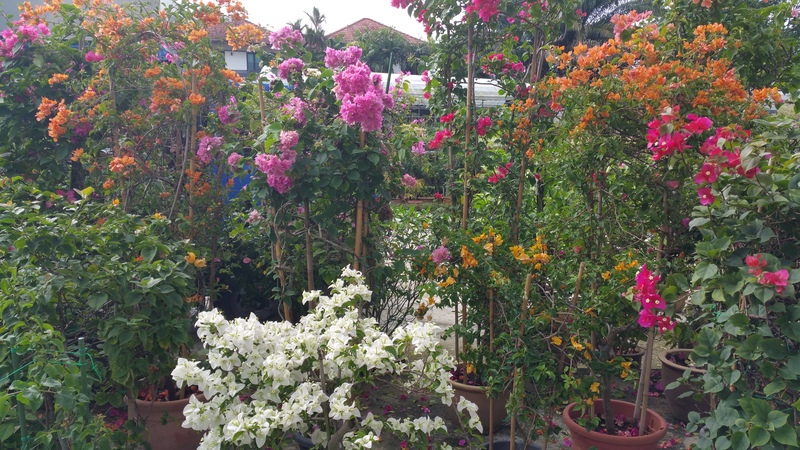 Potted bougainvilleas growing beautifully in full bloom…..white, pink, orange blossoms. First time for me seeing white blooms. I chanced upon these old trees with ferns growing on them. As a sign of their mature age, I could see royal fern, staghorn fern growing out of the boughs like parasites but greening the brown colored trunks. Bird’s nest fern nestled at the base of the tree. But sometimes strenght gives in to that self doubt as how can it humanly be possible that I can never get a good break. I must be the most shittiest person alive! Aah well….back to hugging my inanimate furball and making lemonade. I just hope my left leg don’t start to hurt again as some weeks back, I had 3 steroid injections with pain killers. I have been feeling down lately. I could not understand why my last 3 Lords were employers from hell….DL was a tad better than EL. Probabilities or was it me? I dug deep within self. I worked like a dog, was used, berated and treated unkindly. This started with Scorpion, followed by EL and then DL. In order of horridness, EL leads the pack, followed by DL and then Scorpion King. A member of family accused me of being the “worthless cur”and sentenced me to “being the one with the problem. Sigh! I often wonder why I listen or consider the comments of a “member of family” – these are not worthy people. But fact is, each of these places saw mass exodus and Chicken plus Bird were with me at Scorpion King and they concurred at how horrif that place was. Meanwhile my headaches sometimes do not end, neck feels like a ton supporting a heavy head with vertigo is acting up, followed by nose bleeds. I guess I have to sort that out. Something new for my medical team to sort out? Menieres or whatever, I do realise that when I am older, I could become deaf because of my ear problems. So I took a long walk amidst greenery. Nothing cheers me up than seeing nice architectural homes. These bungalows are easily priced ranging from SGD15,000,000 and even up to $25,000,000 as built up area is huge. It is a shame that for the bungalow below, the helper hung bath towels over the balcony as it marred the beauty of this wooden second floor architecture. I find this “cubism” styled architecture amusing. This home featured below belonged to late President Ong Teng Cheong. I believe this is priceless. He and his late wife were good architects. Sadly they both succumbed to cancer in their 60s I think. I only remembered Mr Ong suffering from lymphoma then. I suppose he saw the merits of this colonial styled bungalow and conserved it. I am unsure if his children stays there now. Tune in to part 2 to see the flora I chanced upon on my walk. After too much of drinking…..
Spooks a haunting might just give me a fright! Brightly illuminated lamps showed streets lighted.